"Ganar Totana has initiated a participatory process to prepare the program with which we will attend the municipal elections of 2019." The mayoral candidate of this formation has informed in press conference. Around forty people attended last Saturday the call, challenging the bad weather, the appointment to be participants in this process, both individually and also on behalf of groups and associations. 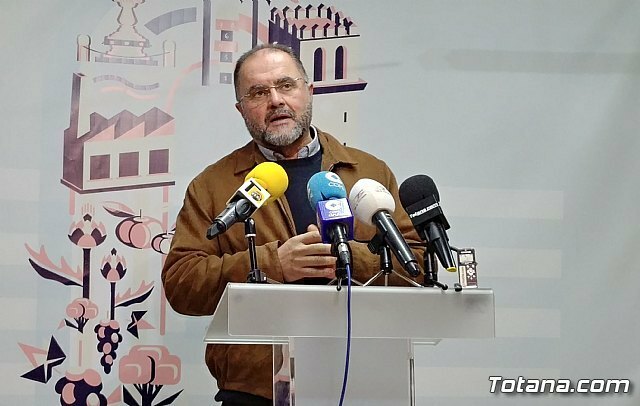 A balance was made and analysis of the elapsed time of the legislature, as well as the work of Ganar Totana in the government team and the first two years of the mayor's office of Juan José Cánovas. "Our project, the one with which we presented ourselves before the neighbors in 2015, has not been able to carry out 100% mainly due to two circumstances: the economic situation that conditions and limits us in many aspects, and also share government with a different political group, with which we have had differences of opinion on issues such as the General Plan or the economic measures to be taken for debt consolidation and stabilization. " In spite of the difficulties, our balance of this necessary transition after the nefarious absolute majorities of the Popular Party is positive and we have been able to achieve great achievements. That is why we face the future with hope and optimism. "To achieve the common goal, the involvement and participation of as many people as possible is essential, which is why we have created participatory work groups to develop a government project with realistic future objectives and in accordance with the economic situation of the City Council. take into account that not everything is a matter of money, that with imagination things can be achieved, and that we are not going to promise anything that does not fit the reality and the possibilities that we have. " The areas of work in which we will divide our project are the following: urban planning and services, economic development, employment and tourism, culture, social welfare and youth, and finally, finance, internal regime and new technologies. Whoever is interested in contributing any idea can send it to us through any means, either social networks or by contacting us directly. Simultaneously, we are also in the process of preparing the candidacy, of which we currently have, through democratic election, the mayoral candidate, Juan José Cánovas. We come from afar, with a long journey and political trajectory based on seriousness, coherence and closeness, which has resulted in a progressive projection that over the years has made us go from 2 representatives in 2011 to 6 councilors / as we are currently part of the government team. "We are facing a multicultural society and very different from the one that existed years ago." Given the political landscape that is looming, we present ourselves to the elections with the aim of being the most voted party with hope and combining youth, experience and renewal to achieve the majority needed to govern and dignify politics, as we have shown in recent years, maintaining a spirit of dialogue and closeness, ending the tension and opening the institution to participation and finding points of encounter in the face of discrepancies. and transversal directed and thought for and for totaneros and totaneras. " Affirms the spokesman of Win Totana. "For all these reasons, Juan José Cánovas appeals to the rest of the candidates for mayor in 2019, to publicly discuss the most important issues and major future challenges, so that they can expose and contrast criteria and proposals with total transparency and visualization of each group in the contest, its government program and each candidate's knowledge of the situation of the municipality and its future. " They conclude from Ganar Totana.